Pre heat oven to 200 Celcius or Gas mark 6. Add potatoes to a large pot filled with cold water. Bring to the boil and then simmer for 10 - 15 minutes until tender and drain. Add basil, rosemary, thyme and garlic to a bowl. Mix together. Pour 1 tablespoon of oil in an ovenproof dish, slide around dish until base is covered with oil. Place the pork steak in the centre of the dish. Next, rub half of the herb garlic mixture all over the pork steak - so that it is covered. Keeping remainder of herb garlic mixture for vegetables. Add the potatoes into the oven proof dish. Drizzle the potatoes with 1 teaspoon of oil. Cover dish with aluminium foil and cook for 1 hour. Tear off a large piece of aluminium foil and place on a baking tray. Pour 1 teaspoons of oil onto foil and scatter chopped vegetables onto baking tray. Scatter remaining herb garlic mixture over the vegetables. Place in oven and cook for 30 - 45 minutes until tender. Remove pork from the oven and leave to rest for 10-15 minutes. 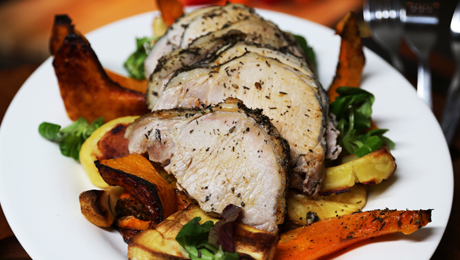 Serve pork with roasted vegetables and potatoes. This recipe makes 4 adult portions.